With the nice weather yesterday, and perhaps also as a symbol of the new season, I took my screwdriver and went out to clean out the birdhouses to make room for this year’s residents. 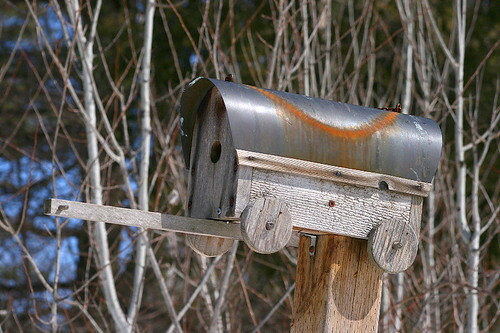 When I was growing up we didn’t have birdhouses set up. I’m not sure why, because we always had feeders. Perhaps it just hadn’t occurred to us. Sometime in university I think I won a birdhouse in a bird-related contest that I’ve since forgotten the details of. We put it up that summer, and it wasn’t long before a House Wren set up shop. The burbling song brought such life to the garden – not that the garden hadn’t been lively before, but the wren just added that sparkle. There’s now five and a half birdhouses out in the garden: four traditional single-unit houses, and a double-unit house. The double-unit is the above covered wagon, which my mom won at a convention or AGM some years ago. By the end of the summer, every single one of these houses has been checked out or used, and they all need cleaning the next winter. The primary residents are the House Wrens, although we have had Tree Swallows and Eastern Bluebirds using a couple of them during the early part of the season (once they’ve fledged the wrens move in and raise a second brood there). There’s perhaps as many as three pairs of wrens on the property, although it can be a little hard to keep track of them. Both compartments of the covered wagon had been stuffed with twigs. Wrens make very characteristic nests in boxes, you can always tell it’s a wren when you take it out. Somehow they manage to tote these twigs, many longer than their own body, back to the nestbox, pull them through the small opening, and stuff them into every corner. They fill every nook and cranny in the box, and the result is a firm rectangular nest that holds its shape even when you take it out of the box. 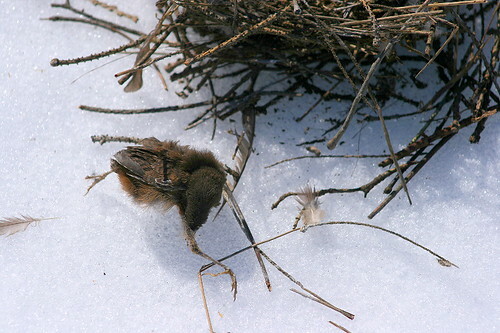 This wren has lined its nest with horse hair, which is abundant at the property, what with there being five of them plus a donkey within easy flying distance. You can tell which horses donated their hair to the nest by the colour of the strands. 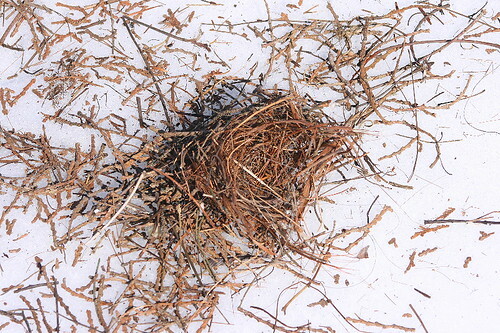 There’s also downy breast feathers from several birds, which suggests that this was a late-summer nest, after some other species had already finished raising their brood and had started moulting in fresh feathers. The bright orange one is obviously from a Baltimore Oriole; the others I’m less sure about, but could possibly be from a robin. In the compartment on the other side of the wagon was this nest, which fell apart as I removed it. It had no lining and appeared to never have been finished. 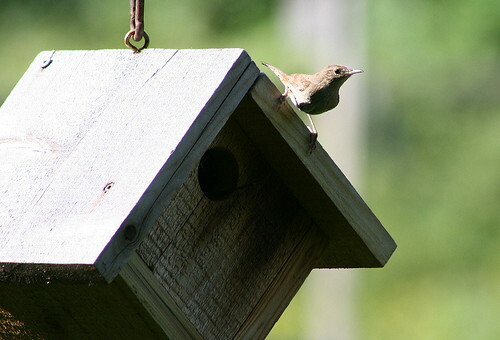 House Wren males will build multiple nest structures that they then show off to their prospective females. The female decides which one she likes best, and then works to finish lining it to start the family in. You can tell a lot about the surrounding trees by what the wren has stuffed in its box; in this case, the box isn’t far from a grove of cedars that would have provided a fair bit of easy, short building material. 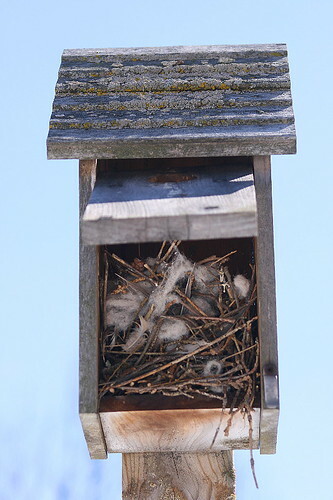 This is the Tree Swallows’ box. They usually arrive early in the spring (perhaps in the next couple weeks) and start checking out the boxes in the yard. They invariably choose this one in the end. They raise one brood and then move off. They leave at about the same time that the wren is looking to start up a second brood (or a third), and he’ll often move in to build his own in there. Here’s the house with the door open. I can’t recall now whether we cleaned this house out between tenants or not, but the wren’s twigs go right down to the bottom of the box, so it’s possible we did, or he stuffed more in there around the swallow’s nest. Either way it’s very much a wren nest now. 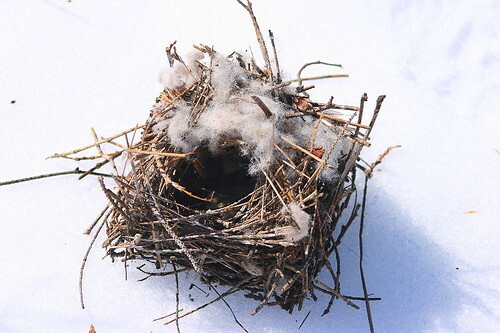 They like for their nests to be a certain height below the entry hole, and will fill the bottom up with twigs to bring the lined nest up to that height as necessary. The hole in the covered wagon is much closer to the bottom than in this nestbox, and so the twigs were used more to fill the back of the space than to fill the bottom, you could actually see the snow through the bottom of the cup. In this case they needed to bring the height up a fair bit, and the bottom two or three inches are solid twigs. 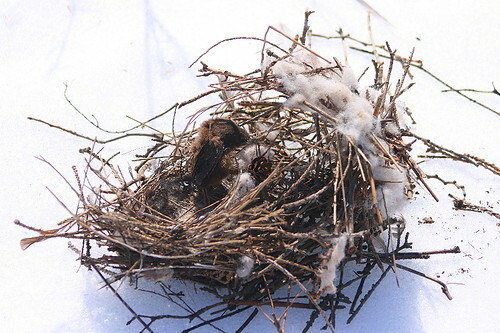 I’m not sure what laundry Mom was hanging out on the line at the time, but it may have been a sleeping bag or comforter – the lining at the top of the nest is partially composed with synthetic fluffy filling. When I opened the nest up to check out what the wren had used in building it, I was surprised to discover something in it. At first I thought it was a clump of fur, maybe leftover from an owl’s rabbit kill or something like that, that the wren had picked up. But it turned out to be a little baby wren, old enough to have fledged, but still in the nest. Why? The answer was in its position. One leg was stretched out way in front of its body, and in removing the little bird from the nest I found a strand of the synthetic filling wrapped around its foot. I actually had to snap the strand to get the bird out of the nest. 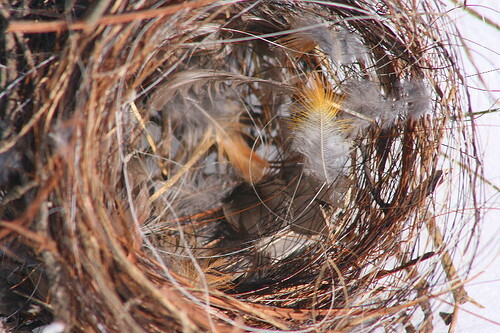 Evidently the nestling had become caught, and couldn’t leave the nest when its siblings did. It would have starved to death as a result. It’s rather sad. The nestling was soft in my hand. They are the most beautiful mousey brown, even the colour suggests soft. 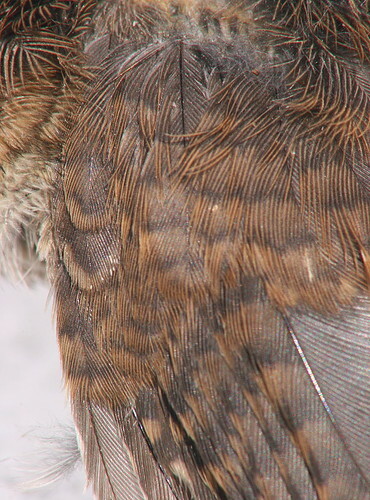 Their wing feathers are a little rustier, particularly when young, and barred in neat lines characteristic of wrens. 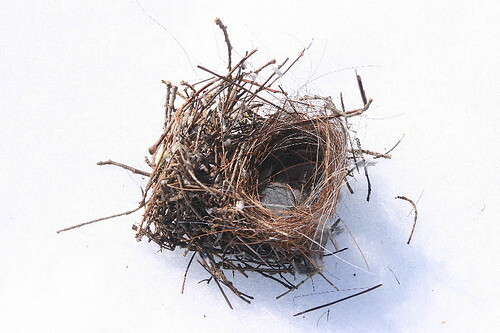 I left it in the nest contents where I found it. I feel sad for it, but I also have to consider that this is nature. Perhaps only one of those young birds that left the nest last summer will survive to return to the area this spring. A bird’s first year is brutal, and the death rate among first-year birds is very high. Once a bird has made it through its first year its chances of surviving to three or four years, or perhaps even longer, is greatly increased. So instead of dwelling on this one death, I look forward to the return of these cheerful little birds, the ones who’ve made it through another winter, in the coming month. Terrific post! First year birds do perish… Your observations are wonderful. House Finches in a Barn Swallow nest, I wouldn’t’ve guessed that! What a neat observation. Yes, they’re definitely hardy little birds! What a fascinating journal, and a touching story about the little wren who didn’t make it. Although I live in the city, I make forays into the wild as often as I can, and I love watching the birds about their business. 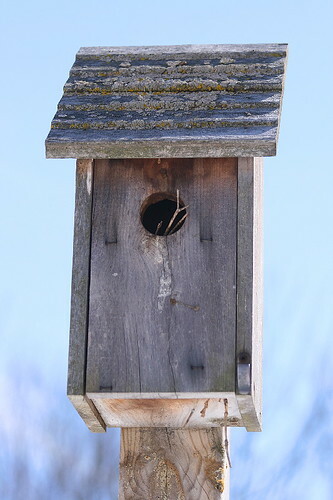 Last spring, we stopped on a backcountry road on the Bruce Peninsula to identify a dozen finches, and I remember being mesmerized by the sight of a house wren tirelessly building a nest in a birdhouse next to the road. Thanks, Gillian. Like you, I live in the city and venture out to the countryside for most of my hiking. My parents live (and I grew up) in the country so I get lots of opportunity when I return there to visit, fortunately. The wrens have always been one of my favourite garden birds out there, too, lots of fun to watch. Fantastic blog! Do you have anny tips for aspiring writers? I’m planning to start my own website soon but I’m a little lokst on everything.